The entire Massachusetts Congressional delegation (two Senators and all nine Representatives) signed a statement of support for ME/CFS patients which was shown on the occasion of the screening of the documentary film “Unrest” on November 12, 2017 at the Regent Theatre in Arlington, MA. Our delegation's support for patients with ME/CFS was projected on the big screen at the event, which was attended by more than 360 healthcare professionals, ME/CFS patients, families, and supporters from Massachusetts and New England (VT, ME, CT, RI). We were proud to announce that Massachusetts is the first state that has had such a statement from every member of its congressional delegation. UNREST at the Regent Theatre - A Huge Success! Our special showing of the Sundance award-winning documentary, UNREST, by Jennifer Brea on Sunday, November 12, 2017 at the Regent Theatre in Arlington, MA was a huge success, thanks to our many volunteers who organized the event, our many co-sponsors who promoted the event, and the more than 360 people who attended, including many health care professionals and researchers. The event was packed! The UNREST production team believes our event was the most well-attended community-organized screening of Unrest ever held in the country. Panel/Video: Our panel moderator, Deborah Becker, WBUR (NPR’s Boston station) senior correspondent/host, and our panelists, Mary Dimmock (ME Advocate), Michael VanElzakker (ME Researcher), Kiki Zeldes (ME Patient and Women’s Health Advocate) and Lisa Hall (Healthcare Professional), did a wonderful job sharing their perspectives and fielding audience questions for 45 minutes. Video of the opening remarks, panel discussion and audience Q&A is now online to share with others. This awareness-raising video is available to be shown on local cable TV stations in New England and the entire US. If you can help by asking your local cable station to air it, please contact us. 19 co-sponsoring organizations: Government, healthcare, academic, disability, ME/CFS, religious, arts, and women's organizations co-sponsored our event (all are listed here). They included the MA Department of Public Health and the Division of Women's Health at Brigham and Women's Hospital. 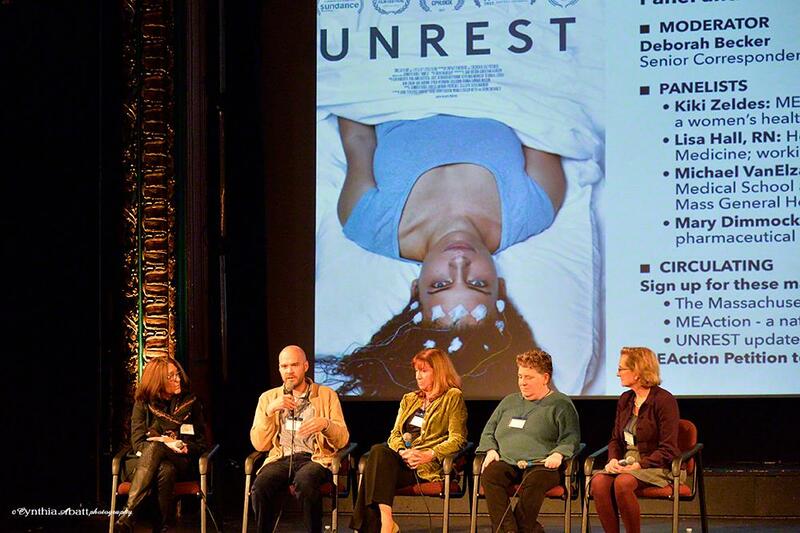 This was the most diversely-sponsored ME/CFS event ever held. UNREST is a moving and beautiful film and an excellent way to raise awareness about this devastating disease that impacts an estimated 28,000 people in Massachusetts and 1 to 2.5 million in the US. We invite you to help us continue to raise awareness about ME/CFS in the medical and healthcare community. Are you available to discuss bringing UNREST to your institution? If so, please contact us. New Guide: Additionally check out this MEAction Best Practices Guide for how to organize larger, impactful UNREST events. They used our successful event as their case study. The long-awaited Pediatric ME/CFS Primer, written by an international group of pediatric ME/CFS expert clinicians, is now published and freely available. Not only does the Primer contain a wealth of practical clinical advice, it also includes facts sheets and sections on working with schools and a sample physician’s letter to the school, authored by Faith Newton, Ed. D. It is a valuable guide for health care providers, parents and families, and school personnel. "Myalgic Encephalomyelitis/Chronic Fatigue Syndrome Diagnosis and Management in Young People: A Primer"
Faith Newton Ed.D., Department of Education, Delaware State University, Dover, DE, USA contributed Section “The School System” and Appendix D.
Appendix F is based upon “Considerations Prior to Surgery for Adult ME/CFS Patients” by Dr. Charles W Lapp MD, Director, Hunter-Hopkins Center, Charlotte, NC, USA, with permission. Myalgic encephalomyelitis/chronic fatigue syndrome (ME/CFS) is a complex disease that affects children and adolescents as well as adults. The etiology has not been established. While many pediatricians and other health-care providers are aware of ME/CFS, they often lack essential knowledge that is necessary for diagnosis and treatment. Many young patients experience symptoms for years before receiving a diagnosis. This primer, written by the International Writing Group for Pediatric ME/CFS, provides information necessary to understand, diagnose, and manage the symptoms of ME/CFS in children and adolescents. ME/CFS is characterized by overwhelming fatigue with a substantial loss of physical and mental stamina. Cardinal features are malaise and a worsening of symptoms following minimal physical or mental exertion. These post-exertional symptoms can persist for hours, days, or weeks and are not relieved by rest or sleep. Other symptoms include cognitive problems, unrefreshing or disturbed sleep, generalized or localized pain, lightheadedness, and additional symptoms in multiple organ systems. While some young patients can attend school, on a full or part-time basis, many others are wheelchair dependent, housebound, or bedbound. Prevalence estimates for pediatric ME/CFS vary from 0.1 to 0.5%. Because there is no diagnostic test for ME/CFS, diagnosis is purely clinical, based on the history and the exclusion of other fatiguing illnesses by physical examination and medical testing. Co-existing medical conditions including orthostatic intolerance (OI) are common. Successful management is based on determining the optimum balance of rest and activity to help prevent post-exertional symptom worsening. Medications are helpful to treat pain, insomnia, OI and other symptoms. The published literature on ME/CFS and specifically that describing the diagnosis and management of pediatric ME/CFS is very limited. Where published studies are lacking, recommendations are based on the clinical observations and practices of the authors.